I was all set with another post this morning, but I decided to change after last night's high school football playoff game. I did the usual: run home after work, let the girls out, grab football gear, and go to the school to help get the concessions ready. Got there, started prepping, and...Oh, Snap! I forgot that I had taken the pumps for the cheese, mustard, and ketchup home to wash. Get in car, drive home (it's all of 2 minutes), grab the pumps, back to the school. Let me back up: the first time I was home, I almost grabbed my camera, but thought, "I don't think anything's going on tonight; I won't need it". Mental note to self: Don't go anywhere without my camera, even if I think there's nothing going on. (So, you'll have to excuse the quality of the pictures...I took them with my phone.) We live near an Air National Guard Base, and, in honor of Veterans Day, there was a helicopter that landed on the practice field (behind the game field). Names of deceased veterans from the small town were read, whether they lost their lives in battle or not. It was a very surreal moment. You could've heard a pin drop in that stadium. A tear or 2 may have been shed, especially when Taps was played by a member of the ANG Band. The flag was raised by members representing each armed service, with an elementary school child singing the National Anthem. Even though he got a couple of the words wrong, he did such a great job. The innocence of a child and the hard reality of the world were both represented. 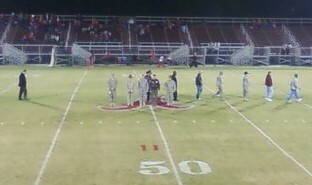 Before the game veterans that are "part of the small town family" were honored on the field. They were handed the game ball as they were recognized. The game ball was then presented to the officials, and one of the servicemen did the coin toss. CH wasn't on the field...apparently he didn't submit his name and information, but he said he didn't need the recognition. All in all, a great tribute to the men and women who dedicated part of their lives to the service of our country. Oh, and the game: Small town won 42-17. Next week is a rematch with the #2 team in the state, who just happens to also be in our district (we won during the regular season -actually just a couple of weeks ago- 50 to 33). It should be a good game: they aren't intimidated by small town. If they can get by #2, my prediction is that they win state championship #7 in a row. Wherever your "small town" is - it sounds wonderful. Sweet times. that does seem like a fitting tribute to those who served! I like how it was organized and incorporated with the football game! I love small towns...and their salutes to veterans. Love the fact that it was incorporated with the football game...makes it that much more special. Sounds like a very special evening. So glad you were able to share in it. It really touches my heart to see tributes like this. I can't imagine how it feels to our servicemen and women. The whole thing really was a great tribute! Unfortunately the kids and I were down getting burgers during all of it so I have NO pictures! Boo! Such a beautiful tribute--and done in a way that I bet meant a lot to the kids, especially the players.